Small plastic recycling machine from Beston Machinery is very popular among investors. It is small in scale and low in costs, which is an ideal business project for small investors. Beston is a leading waste plastic recycling machine supplier in China, even around the world, which always provides customers with the best products and service. First of all, we have a wide range of products with a full line of specification from small, medium to large scale. Moreover, we will offer you the best waste plastic recycling machine price to lower your investment costs. Especially, we have rich manufacturing, exporting and installing experience of the small-scale plastic recycling plant. So, if you are looking for a small scale plastic recycling machine for sale, do not hesitate to contact us! Now we have two models of small plastic recycling machines for sale, namely BLJ-6 and BLJ-10. 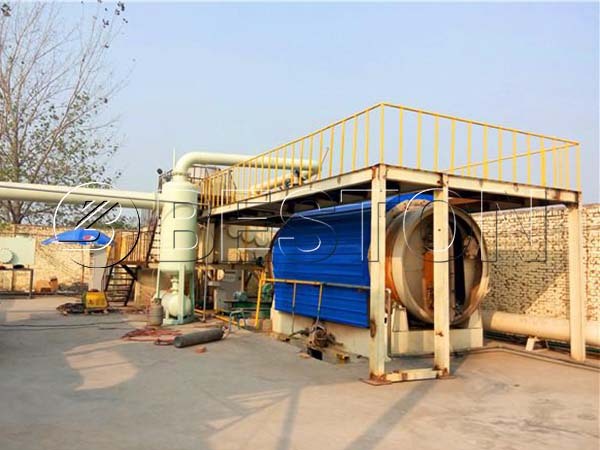 As for the working method, they are batch operating pyrolysis plants with the daily capacity of 6 ton and 10 ton. In addition to waste plastics, the equipment can be used to process old tires, rubber, oil sludge as well. Here are more parameters for your reference. 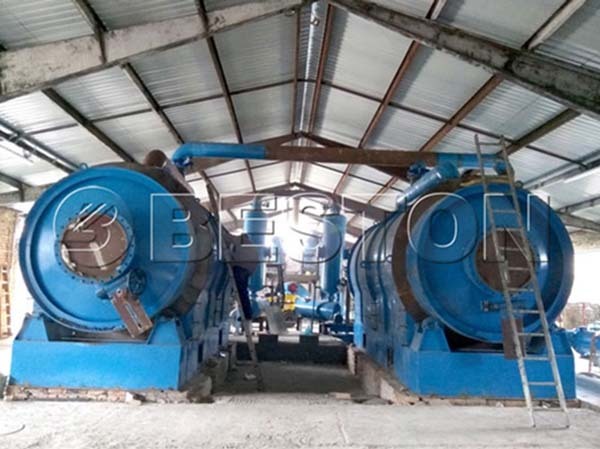 Except for these two model of small plastic recycling equipment, Beston Machinery has also developed mature technology in semi-continuous and fully continuous waste recycling plants. Various options to meet all your requirements. We are ready to serve you at any time! Small plastic recycling machine price is lower than the large ones. Due to the scale, it also requires less space, construction works, etc. Moreover, Beston Machinery will provide customers with a reasonable plastic recycling machine price to maximize your profits. In a word, a small plastic recycling machine is cheap in price, which is affordable for many investors. 2. Easy and safe to operate. Even a small scale plastic recycling plant is a batch operating type, Beston has adopted advanced plastic waste recycling technology to make it easy and safe to operate. For example, there is a professional thermometer and pressure gauge to inspect temperature and pressure at any time. With mature devices and advanced systems, our plastic pyrolysis plants can process high-quality final products, including carbon black and fuel oil. Meanwhile, we can also promise you a higher oil quality and yield, which will bring you great benefits and help you get your investment back very soon. On the one hand, the heating system of Beston small plastic recycling plant can save about 40% of energy. On the other hand, we have equipped an advanced dedusting system to remove 95% dust of exhaust gases to make sure the whole working process is free of pollution. Thus, you never worry about environmental policy. Beston, as a professional plastic recycling machine supplier, will provide you with an eco-friendly business plan. That’s why our plastic pyrolysis plants have been successfully installed in UK, Australia, South Africa, etc. The service life of Beston small plastic recycling machines can reach up to 5-8 years, which can save much money for you to maintain and update. 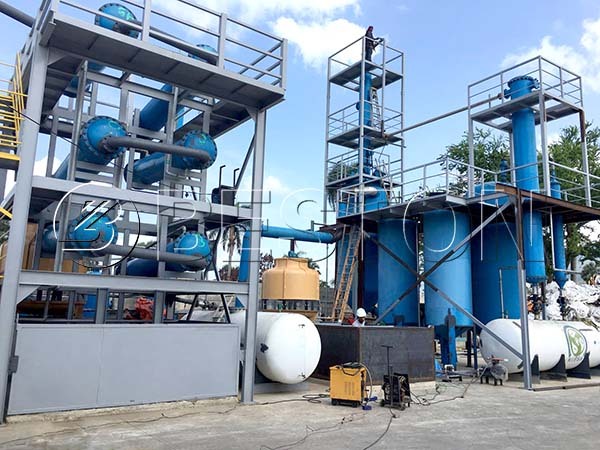 BLJ-6 and BLJ-10 are batch pyrolysis plants, which means it works intermittently. 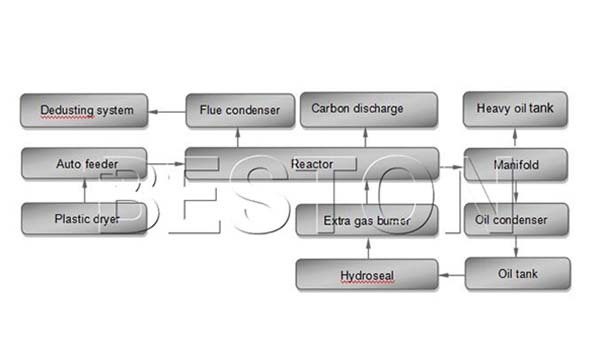 In general, the raw materials can be put into the pyrolysis reactor directly by workers. While if the waste plastic is wet, it is better to employ a plastic dryer to dry it first to save energy and time. During the oil pyrolysis process, the waste plastics should first be heated to 400 degrees in an oxygen-free reactor. Under this condition, the waste plastic will be melt and release gas at the same time. Part of these gas will go back to the reactor and then act as the fuel until it is pure enough. 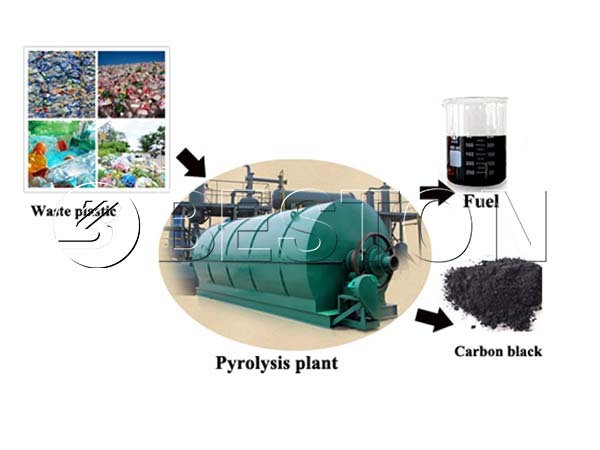 When the oil pyrolysis has been finished, the carbon black will be discharged. While it often takes about 3-4 hours for the rector to cool down before the second batch. The small plastic recycling plant is able to process 6-10 tons of raw materials one day. It needs feeding time for one and a half hour, processing time for 7 hours, cooling time for 2 hours, and discharging time for two hours. It will produce 3 end products, oil, carbon black, and combustible gas. Here is a table for the application of the end products of waste plastics. Crude oil • can be sold directly. Carbon black • can be sold directly. Combustible gas • can be as fuel heating the reactor. 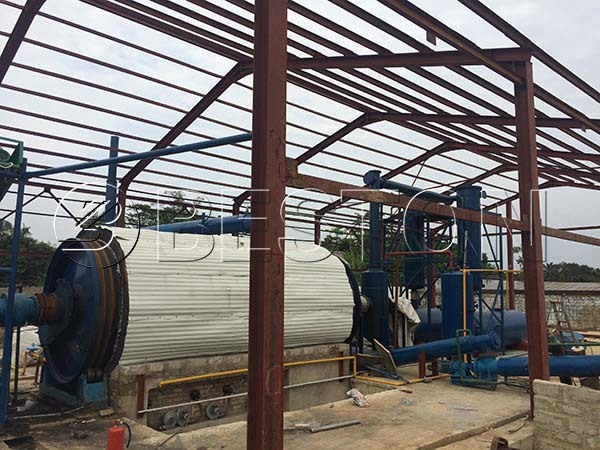 The small plastic recycling plant can also process different raw materials, including used tires, waste plastics, rubber, oil sludge, and even medical wastes. While if you are going to process medical waste, you need the disinfection treatment first. Obviously, a small plastic recycling machine is a great investment plan. 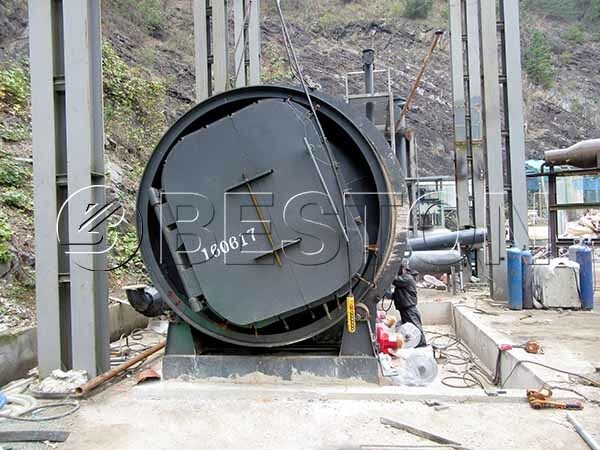 And Beston can customize a small scale plastic recycling plant project report according to customers’ requirements. All in all, setting up a small plastic recycling plant with Beston Group will be a wise choice. Welcome to contact us now!